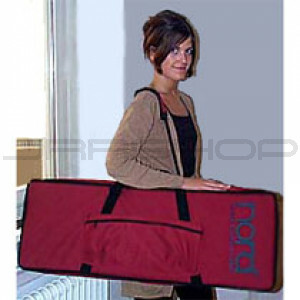 Clavia's newly designed lightweight soft case for Nord Lead and Nord Lead 2 (and Nord Lead 3 and Nord Electro61) is made out of textile with a padded interior and a reinforced cover to protect the synth's knobs. It also has an extra case for pedals etc. It features regular handles as well as a comfortable shoulder strap. You can also use it as a back pack using the two additional straps that are included.